Clean meat, add water, use big flame to cook for 15 minutes. Take out the meat, clean pot, put meat into pot, put in Pao Xiang Teow Chiew Bak Kut Teh spices mixture (1), pork intestine 800g, hot water 8 liter, use medium flame to cook for 30 minutes. Add spare ribs 600g, soft bone 600g, salt 35g. 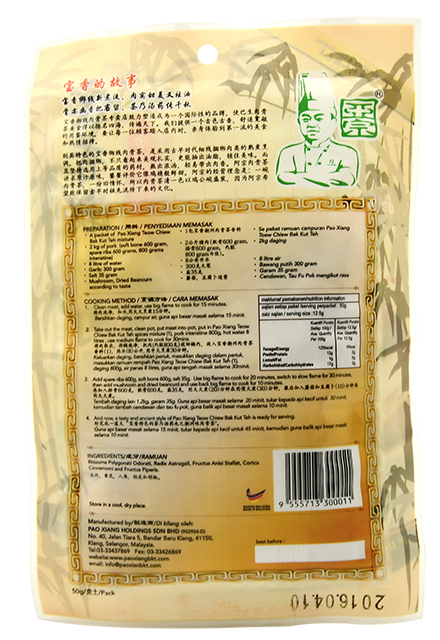 Use big flame to cook for 20 minutes, switch to slow flame for 30 minutes, then add mushroom and dried beancurd and use back big flame to cook for 10 minutes. 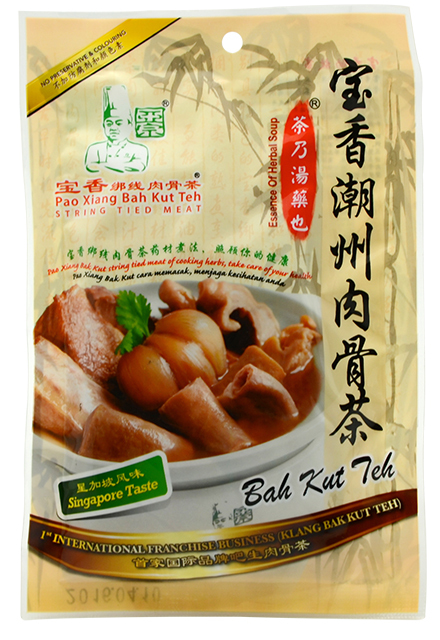 And now, a tasty and ancient style of Pao Xiang Teow Chiew Bak Kut Teh is ready for serving .